This book is a comprehensive understanding of the evolution of pre-malignant disease, emphasizing common themes in the field, including stem cell biology and histologic modes of cancer progression between the distal esophagus and stomach. Its sixteen chapters discuss metaplastic tissue change in the upper GI, clonalexpansion of early neoplasia, stem cell dynamics in experimental models, pathology of early esophageal squamous cell carcinoma, therapeutic modalities for esophageal squamous cell carcinoma, pathology of Barrett's esophagus, screening, early detection and novel diagnostic tools for Barrett's esophagus, clonal evolution of Barrett's esophagus, endoscopic therapeutic modalities of early esophageal cancer, pathology of early gastric cancer, and experimental models for gastric cancer. 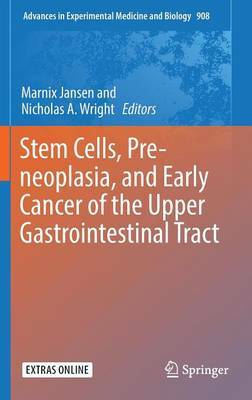 Stem Cells, Pre-neoplasia and Early Cancer of the Upper Gastrointestinal Tract is an integrative text on both the current state of translational research on every cancer development of the upper gastrointestinal tract as well as on novel clinical diagnostic and therapeutic modalities. It highlights a rapidly growing field within cancer research and is essential reading for oncologists, biochemists and advanced graduate students alike. Springer's Advances in Experimental Medicine and Biology series presents multidisciplinary and dynamic findings in the broad fields of experimental medicine and biology. The wide variety in topics it presents offers readers multiple perspectives on a variety of disciplines including neuroscience, microbiology, immunology, biochemistry, biomedical engineering and cancer research.